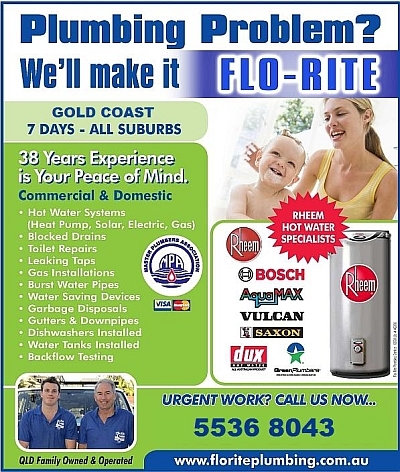 Flo-Rite Plumbers services all Gold Coast suburbs. We offer fast response and most importantly, to be on time. For all plumbing repairs contact Flo-Rite Plumbers Gold Coast to solve any plumbing, drainage, gas fitting and hot water problems. All of our trades people are professional employees of the company, we do not outsource our work to sub contractors. We are a respected plumbing contractor on the Gold Coast and our services are comprehensive. We have built our long standing reputation on quality plumbing, drainage, hot water and gas fitting services. Flo-Rite Plumbers Gold Coast guarantee our friendly and courteous plumbers are committed to fixing your plumbing problems every time. When things go wrong with your plumbing, it's good to know that Flo-Rite Plumbing your Plumbers Gold Coast service experts are there to help you, no matter how large or small your problem is.